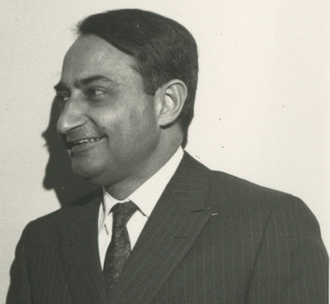 Dalbir Bindra, known widely as DB by his friends and colleagues, was an influential figure in the development of the Psychology Department at McGill. Like his brothers, he was born into the warrior caste in Rawalpindi India, but he did not follow their paths into military service. While his siblings eventually rose to the ranks of admiral and general, he chose to devote himself to academia. Though interested in science from the start of his education, he only later came to be interested in the rapidly accelerating field of psychology. At the Punjab University in Lahore, he studied a wide selection of subjects including the early psychology of Watson, Pavlov, and Skinner. His excellent grades and ambition granted him an acceptance into Harvard. There he earned his MSc in 1946 and PhD in 1948, working under J.C.R. Licklider. He was highly interested in in animal models at the time, and investigated the manner in which rats hoard food. After a brief stay at American University in Washington DC, Dalbir Bindra joined the McGill faculty in 1949, just around the time when Donald Hebb was appointed as the department Chair. Over the next 30 years, Dalbir Bindra became one of the Department’s most beloved members, eventually becoming the Chair himself in 1975. Early on Dalbir was interested in investigating the motivation of animals. Decades of his work were synthesized into his first book Motivation: A Systematic Reinterpretation, published in 1959, within the same timeframe as George Miller’s “The Magical Number Seven, Plus or Minus Two” and Noam Chomsky’s “Review of Verbal Behaviour, by B.F. Skinner”. Bindra analyzed motivation through the trinity of perception, learning and cognition. His drive to integrate these mental features also pushed him to expand the scope of his own research. As a result, over the next 15 years he became highly interested in intelligent behaviour. He defined it in part as “anticipatory choice and planning” and proposed a much more complex view of the phenomena than was present in existing literature. His findings on intelligence were reported in his second book, A Theory of Intelligent Behaviour, published in 1976. Along with his academic pursuits, Dr. Bindra was also highly respected as a teacher and administrator. He demanded hard and careful work by his students. He believed that it was important to give fair and rational assessments of a student’s work. Many of his students went on to achieve great academic success, such as Donald Peter Cain, Lynn Nadel, and Roy Wise. Along with Hebb, Dalbir helped to bring the mind and brain sciences to the forefront of McGill’s funding priorities as well as its public image. His lobbying efforts accelerated the inclusion of the field of psychology in the National Research Council of Canada. Dalbir earned many awards during his academic time at McGill. He was a fellow of the Canadian Psychological Association, The American Psychological Association, and the Royal Society of Canada. His efforts granted him the prestigious Canadian Centennial Medal in 1967. Apart from his work, Dalbir led an active life. He enjoyed skiing, gardening, and swimming, and was an avid collector of Canadian fine art. He and his wife Jane Stewart enjoyed having friends over, and entertained regularly. Dalbir Bindra died young, at the age of 58, on December 31st, 1980. He was written about fondly after his passing as the “quintessence of the rational man”, by his friend George Ferguson. Today, along with Donald Hebb and John Macnamara, he is honored through an annual lecture series at the Department of Psychology McGill. Bindra, D. (1959). Motivation: A Systematic Reinterpretation. John Wiley & Sons Canada. Bindra, D. (1976). A Theory of Intelligent Behaviour. Oxford: Wiley-Interscience.